You're in Subway, say, patiently waiting while the, erm, "Sandwich Artist" assembles your turkey & cheese with-everything-but-tomatoes-and-not-too-much-mustard-please, and a guy comes in. This guy has apparently never been in a Subway before--he walks up to the register first and tries to order there, so the semiliterate drone at the register has to point him over to where one actually orders, and then he is utterly blindsided by the white-or-wheat question, and then when he makes it down the line to the register drone again, confusion reigns: Sub Club card? What? Wait, wasn't this combo supposed to come with chips? Oh, they're right behind me? It's not as if everyone in America needs to know the exact protocol for eating at Subway; heck, I wish I could say I didn't eat at the one a block from my old office in Durham every week or so. But still, you'd think that guy would have a clue, right? When you move to a foreign country, you are that guy. Which line do you stand in at a French post office? Where are you supposed to validate your ticket at the parking garage? Do you bus your own table at this sandwich stand? Will they bring your food or do you stand around and wait for it? Where do you get a key copied, and how many forms of ID will you have to show to do so? How do you get your packages when they won't fit through the tiny mail slot? Who do you call to report a power failure? Does this hotel have ice machines? Where? Where do you return your library books? And where do you wait while the librarian examines each one of them individually for damage? Some of those questions I've learned the answer to through trial and error, through being That Guy, through suffering the eye-rolling and Gallic shrugs of hundreds of retail/service employees across the Rhone Valley. Some of them I still don't know the answer to. 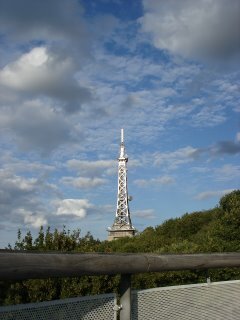 I have learned that accomplishing most anything in France takes about three times as long as in the US: There's the time it takes you to figure out how to accomplish the task, the time it takes for the task itself, and the additional time it takes to move the rusty wheels of French bureaucracy. The corollary to this rule of three is that the first time you do anything, you will look like a complete idiot. Good thing I have so much experience at that. Pic #1, above: Look kids, it's the Eiffel--whaa? Lyon has its own poor copy, the Tour Metallique, opened around the turn of the (20th) century for some exposition or another. It's closed to the public now, serving the dual purposes of convenient platform for commo gear and crapping up the Lyon skyline. 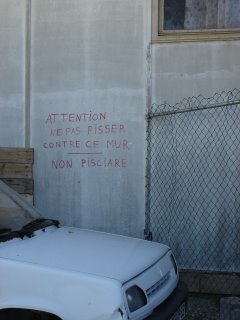 Pic # 2: "Do Not Piss on This Wall." Some habits are hard to break, I guess. Taken at the Puces du Canal, a huge flea market that draws shoppers and dealers from as far away as Italy, hence the helpful Italian translation. The Puces have a huge variety of things, ranging from fine furniture to old Tintin comic books, but the best thing I saw on this day was a complete (and running) WWII-era olive-drab scout/courier motorcycle with sidecar. 3000 Euros OBO. Oh man, if I had one of those, I'd just need a leather helmet and goggles... oh, and a monkey to ride shotgun. Preferably a grinning chimp or a soulful orangutan. We'd rule the world, my monkey and me. Who is this person of whom you speak? There are only anonymous marching frogs here. Pshaw. As if any of the eight people who read this thing don't know exactly who I am, what I do, what my phone number is, etc. I just keep up the anonymity gag so it feels like any moment I could, say, reveal the source of the Valerie Plame leak, or post the track listing and release date for Guns 'n'Roses' "Chinese Democracy". On the internet nobody knows you're a frog.